Om Puri (left), Manish Dayal - as father and son hoping to open Maison Mumbai - and Helen Mirren mull it over in the south of France. If food be the music of love, eat on. Perhaps not quite how Shakespeare put it, but then, the Bard never got to see The Hundred-Foot Journey, an impossibly overstuffed culinary culture-clash rom-com in which an imperious French restaurateur and a Mumbai family looking to open a kitchen in a quaint Pyrénées village do battle with pots and pans, spatulas and sieves, brûlée and brouhaha. 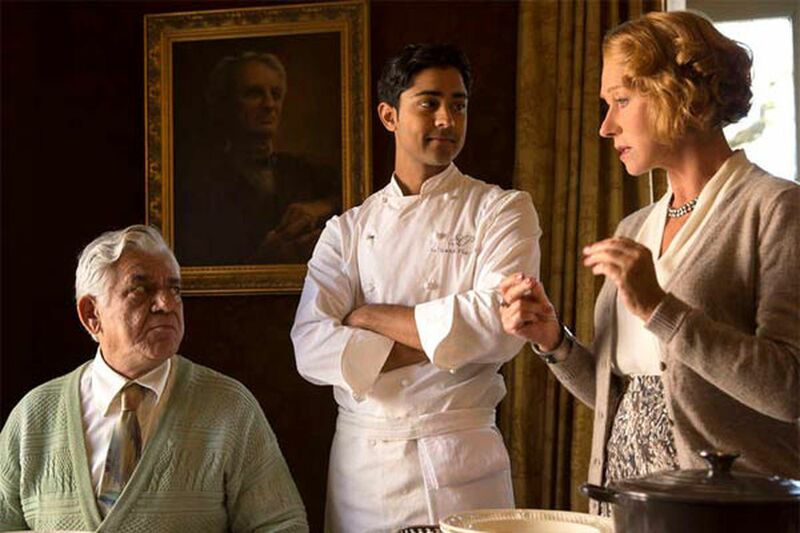 By the time Madame Mallory (Helen Mirren) and her sous chef Marguerite (Charlotte Le Bon) are done trading blows with Papa Kadam (Om Puri) and his talented cook of a son, Hassan (Manish Dayal), the feud has turned into a feel-good feast full of romance and Michelin stars. Based on the Richard C. Morais bestseller and brought to the screen by Lasse Hallström the only way the director knows how (lush, dreamy, subtlety dropped at the door), The Hundred-Foot Journey is, like the recent Jon Favreau flick Chef, a celebration of the gustatory arts in which people make important discoveries about themselves while they're slaving over a hot stove. In a prologue set in India when Hassan was still a lad, we see him in a marketplace, fascinated by the shape and smell of bristly black sea urchins. "The sea urchins taste of life, don't you think?" the boy's mother says, adding that "life has its own flavor." Ah, so wise. But the Kadams (sans Mom) are forced to flee India, landing first in Rotterdam, then in a drab spot near Heathrow, before taking their rickety van across the Channel. On a precipitous road in the south of France, Papa loses control of the vehicle. A welcoming villager - sous chef Marguerite - invites the frazzled family back to her place, where she rustles up an impromptu meal that has the Kadams popping their eyes in delight. "Brakes break for a reason," Papa says, deciding that this town, Saint-Antonin, and the shuttered restaurant with the "for sale" sign are his destiny. The fact that the building is but a mere hundred steps across the street from Le Saule Pleureur, the renowned dining spot run by Madame Mallory, does not matter to Puri's Papa. It does matter, however, to Mirren's Mallory - a woman accustomed to serving politicians and gourmands, who inspects her kitchen staff like a general before the troops. Maison Mumbai? Really? Sacre cordon bleu! It would be curmudgeonly to count all the ways in which The Hundred-Foot Journey is unsurprising, unrealistic, unnecessary. (Note will be made, however, of Mirren's haughty Gallic accent - the great British actress never quite lands it.) Montages of exquisite dishes being prepared exquisitely - pigeon with truffles, tandoori chicken - will warm a foodie's heart, and Dayal, the handsome actor who plays the gifted and curious Hassan, is a star. Whether he's wooing Marguerite, wowing the Madame, or worrying his dad, the American-born actor is a charmer. Another food-centric romance with an Indian menu, The Lunchbox, enjoyed much-deserved success on the arthouse circuit this spring. The Hundred-Foot Journey - produced by Steven Spielberg and Oprah Winfrey, no less - aims to curry flavor, I mean favor, with a wider audience. The toque has been thrown down. Directed by Lasse Hallström. With Helen Mirren, Om Puri, Manish Dayal, Charlotte Le Bon. Distributed by DreamWorks Pictures/Disney. Running time: 2 hours, 2 mins. Parent's guide: PG (violence, adult themes).